Happy 50% off candy day! Now have some cool stuff. Oh look – he made a 3-D Printed TARDIS Transformer, too!! I’m rather happy with how my own Halloween costume turned out. 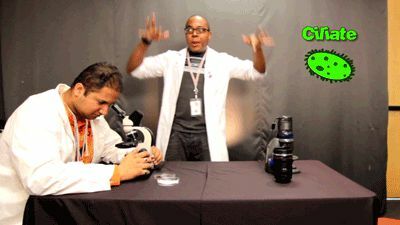 Coma Niddy University presents: How Microorganisms Move. I’m not showing this post to my husband. He spends way too much time looking at YouTube videos of 3D printers already. Quokkas are native to one place only in Australia: Rottnest Island, off the coast of Perth, Western Australia. They’re the reason the island has its current name – Willem de Vlamingh, when he drifted down here back in 1696, thought the island was full of rats (and thus named it “rat’s nest” in Dutch). He also named the nearby Swan River, after the black swans he found swimming on it (thus demonstrating where our grand Australian “state the bleeding obvious” tradition of nomenclature got its start… we’ve since carried on with names like The Great Sandy Desert, the Snowy Mountains, the Nullabor Plain, the Great Ocean Road, the Great Dividing Range, the Southern Ocean, and, of course, Western Australia).